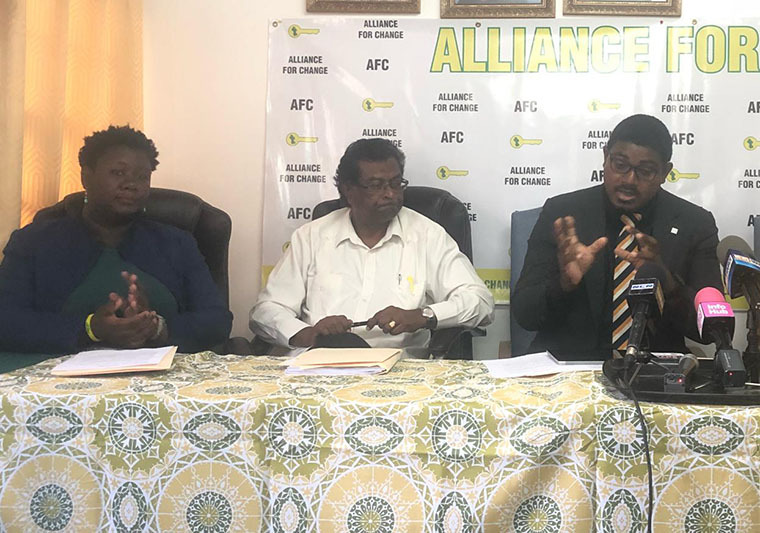 The Alliance For Change (AFC) is going to initiate proceedings to enable it to respond to the allegations made in an ongoing court action that claims its candidates fraudulently procured the names of persons listed as their backers for the upcoming Local Government Elections (LGE), party chairman Khemraj Ramjattan says. 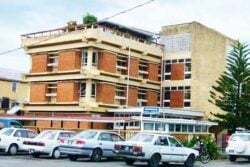 Ramjattan made the disclosure last Wednesday while reacting to an action brought by a People’s Progressive Party (PPP) candidate, who has accused an AFC candidate of deceiving persons into signing on as nominators. Speaking at the AFC’s weekly press conference at its headquarters, Ramjattan denied that his party used illicit means to get nominators, saying “absolutely nothing of the sort” happened. “We are now aware that a girl, along with two others persons, went to the home of the plaintiff in this matter—and she’s related to the man,” Ramjattan said, while saying the plaintiff had volunteered to be on the list to back one of the AFC’s candidates. “The three persons went there one afternoon and the fella did not only sign voluntarily, his wife signed and his daughter signed the document. So, it was totally voluntarily done. The girl along with the two other persons are willing to give the police a statement to that effect,” Ramjattan explained, while stating that they have found out that it was the PPP that bullied the plaintiff into making the allegations against the AFC candidate. In a fixed date application, Shafraz Beekham, of Letter Kenny Village, Corentyne, says he and 49 others were “misled/deceived” by an AFC representative into signing as a “nominator/supporter” of candidate Orlando Christopher Persaud. Police have since been asked to investigate. Ramjattan said the AFC is going to get its lawyers to ask for intervening proceedings so that they can file an affidavit to provide answers to the allegations. “They are the ones that did the pressuring and so, all of this nonsense, I want it to be laid to rest here. We are going to ask for intervening proceedings so that we can be served with all of these documents and so that we can file our affidavit that this is total nonsense,” he said, while adding that they also want the police to launch an investigation into what happened. He also emphasised that all of the AFC’s lists are still valid and over 600 of its candidates will be still contesting in the 38 local authority areas. Meanwhile, the AFC also presented two of its candidates on Wednesday–Amaniah Cort, who will be contesting for a seat on the Yarrowkabra Neighbourhood Democratic Council (NDC), and Trevon Chichester, who will be contesting for a seat on the Woodlands-Farm NDC. Cort said she would focus on youth advocacy, skills training and job creation. “There has never been an NDC in Kuru Kururu, so the area has been neglected for a while and there hasn’t been a lot of development. We are hoping that with this LGE 2018, we are hoping that we are able to set up and get our NDC in working order and begin to enact change,” said Cort, who is currently a teacher in the Soesdyke-Linden Highway community and has been living in the area for her entire life. She also explained that her family was one of the first to settle in the area and as a result she had a vested interest in seeing it move from its current state to a more developed one. 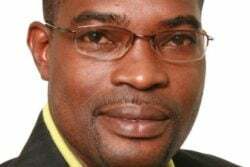 Chichester explained that if he is able to obtain a seat on the council, he will be working towards fixing the drainage, road and other infrastructural issues that currently plague the Mahaicony community. “The things that are plaguing the community are not necessarily strange to the other communities in Guyana. One of the major issues is drainage and what has happened over successive years is that individuals have been building and erecting structures without consideration for their neighbours,” he said, noting that the situation has affected the flow of water and has made the community and surrounding areas easily prone to flooding. He also noted that recent works by the Guyana Water Inc. have left some of their roads in dire condition and resulted in several accidents in the area. Focus will also be placed on streets lights and their maintenance and keeping the roads clean from a build-up of sand and mud, he added.